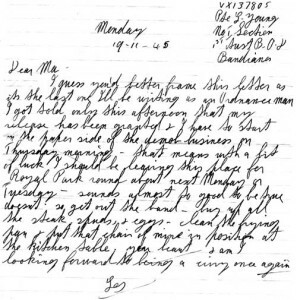 The following letter was written by Les Young to his mother upon learning that he was to be discharged from the army at the end of World War 2. 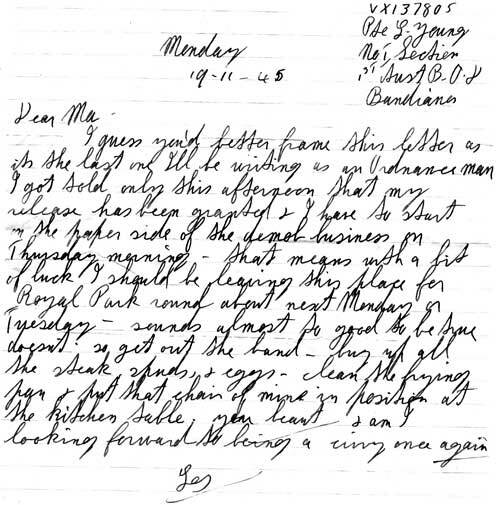 I guess you’d better frame this letter as it’s the last one I’ll be writing as an Ordnance man. I got told only this afternoon that my release has been granted & I have to start on the paper side of the demob business on Thursday morning — that means with a bit of luck I should be leaving this place for Royal Park round about next Monday or Tuseday — sounds almost too good to be true doesn’t (it). So get out the band — buy up all the steak spuds & eggs — clean the frying pan & put that chair of mine in position at the kitchen table; you beaut. & am I looking forward to being a civvy once again.